The second most populated city in the United States after New York City, Los Angeles is called the glamour center of the United States. It spans across an area of 1213 sq kilometers (468 sq miles) and is the nerve center of the state of California. Los Angeles or popularly known by its initials LA, includes Los Angeles, Long Beach and Santa Ana, that together form the Greater Los Angeles Metropolitan area. It has a population in excess of 18 million. It is also the headquarters of the State of California. 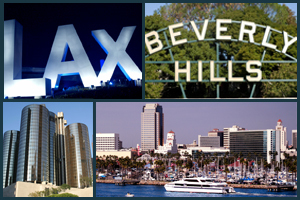 Nicknamed as the city of angels, LA is the 3rd richest and 5th most powerful and influential city in the world. The first settlers of Los Angeles and the surrounding areas were the Tongva and Chumash Native American tribes. In 1542, Juan Rodriguez Cabrillo, a Portuguese explorer claimed this area for Spain. The new empire known as the New Spain Empire achieved its independence from the Spanish Empire in 1821 and LA since then continued to be a part of the Mexican rule. It became known as the capital of Alta California. During the Mexican – American War, California was ceded to the United States with the signing of the Treaty of Cahuenga on January 13, 1847. The Southern Pacific Railroads arrived in 1876 and then in 1892, oil was discovered in California. Together the railroads and oil, catapulted California into a rich and fast growing area of the United States. In 1910, the Hollywood area was added to the Lost Angeles territory and Los Angeles & California were growing at a rapid speed. By the time the great depression of hit the US, LA had become a dominant and powerful city of the United States. After the Second World War, LA started to grow at a faster pace and the city also grew in size. LA became the birthplace of the Internet, as the first APRANET transmission was sent from the University of California Los Angeles. The advent of Information technology started here and that is why California is called the Silicon Valley of the world. Today, LA is a grade A++ city and in rankings falls within the top 5 metropolitan cities of the world. Tourists and visitors tend to throng Los Angeles almost all round the year. While June to August is typically the tourist high season, May and September are best to avoid the crowds. Smog continues to be a problem in the city especially during the hot summer months. From October through March the warm, dry Santa Ana winds blow across LA but are far from being a welcome relief. While attractions are open all through the year, winter may bring reduced hours. Tourist attractions, museums, and galleries are closed on all major holidays over the festive season. Once you arrive in Los Angeles, you will find that you have arrived in the glamour capital of the world. There are a lot many things to do in LA. The most visited is the Getty Centre Museum. The museum is home to a great collection of the works of Vincent Van Gogh and many other contemporary artists. Besides, the view of LA City from this museum is astounding. Many go there simply to catch the superb view of the city. The Walt Disney Concert Hall is the next place to head. This is home to the Los Angeles Philharmonic Orchestra. It has a world’s most sophisticatedly designed auditorium that stages concerts. Try to catch a concert here. You simply cannot miss a show of the IRIS by Cirque du Soleil at the Kodak Theatre. This is a unique cinematic journey through the history of cinema. You have to experience this show to understand the reason why millions flock to catch a show of the Iris. Next on your list must be the Los Angeles County Museum of Art. Located on Wilshire Boulevard, this is a museum that houses particularly strong collections of Asian, Latin American, European, and American art, as well as a new wing showcasing contemporary art from the modern art segments. Griffith Park is another must see site in Los Angeles. Spanning over an area of 4000 acres, this is undoubtedly one of the largest urban parks in the world. Griffith Park houses the Los Angeles Zoo and also has an observatory. The Griffith Observatory is a major attraction. The zoo houses more than 1200 animals, mammals, birds and other animals of 250 different species. There are more than 29 types of endangered animal species too. The nest experience is an experience straight out of the silver screen. A visit to LA is never complete without a visit to the Universal Studio of Hollywood. The visit to the birthplace of most of the Hollywood hits is surely a great experience. The unique studio trip also includes a visit to the Universal Film Museum inside the studio. Experience a journey down history of cinema here at the Universal Studios. Do not miss a visit to the Paramount Studio. Another big studio, which has shaped the birth of Hollywood’s major hits down the years. If you are a music freak, then your next stop ought to be the Grammy Museum. Located on the Olympic Boulevard, this is a museum of all Grammy events. This is a historical tour of music’s greatest awards down the years. Another worthwhile visit would be the California Science Museum. Catch a glimpse of the history of science as it unfolded into life of man. If you are the type who enjoys silent walks on the watersides, make a trip to Venice. This area was modeled to resemble Venice in Italy. Enjoy the beautiful walks by the canals and experience the charm of Italy in California. Another unique museum is the Peterson Automotive Museum. This museum is built to cover an area of 300,000 square feet area on Wilshire Boulevard and showcases more than 150 types of classic cars, trucks and other automobiles. LA is a great place to shop. There are many markets, malls, and streets that have shoppers flocking from all over the world. The Groove is on the top of the list for any shopper. This street is designed to esemble Disneyland and has many signature outlets and many standalone shop offering great buys. Well another place you should not miss is the UCLA shopping center. This is a place from where you can get UCLA and other California merchandise. The biggest brands from across the world have their factory outlets at the Citadel Outlets. This is a great place to shop for fashion at a bargain. If you have not been to the Macy’s then you shopping trip in LA is not complete. Century City Shopping Center & Grand Central market are two other places to simply shop your heart out. Well if you are looking to get a tattoo or have a spa, then High Voltage Tattoo is the place to be. The places to go for shopping in LA are limitless; you are always spoilt for choice. LA is famous for its grand nightlife. A trip down Sunset Boulevard is always the first choice. This place is filled with bars, pubs, nightclubs, strip clubs, and various other nocturnal activity centres. Sunset Boulevard hosts live performances by major celebrities on most nights. The most popular among the bars is the Rainbow Bar. A visit to Rainbow Bar comes highly recommended. Do not miss the Hard Rock Cafe. The LA Hard Rock Cafe has the largest collection of unique rock memorabilia. The Mayan in South Hill Street is another very popular night spot. The Casey’s Irish Bar and Grill is another famous watering hole in LA. The Edison downtown is set in the perimeter of the oldest powerhouse of LA. This is also a famous bar & restaurant and very popular in LA. The list is endless, your quest for an exciting night life in LA, will never hit a blue note.